Huge power and versatility from a portable 1x12 combo. 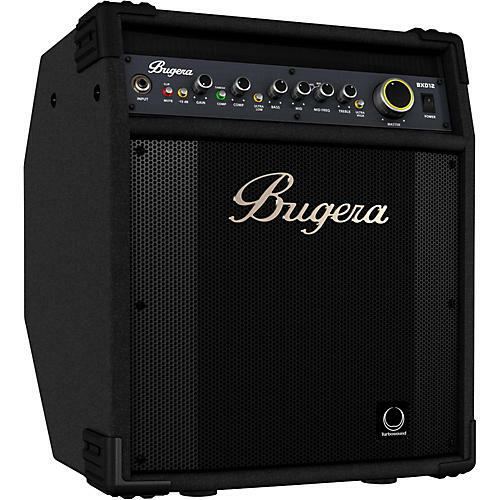 The BXD12 from BUGERA is a fully stage-ready powerhouse, delivering an incredible 1,000 Watts through a world-class, British-engineered 12" TURBOSOUND driver that produces an amazingly clear and punchy attack. Offering superb signal shaping via a high-voltage MOSFET preamp with a wealth of bottom, mid and top-end EQ options, a classic compressor and Bugera's amazing DYNAMIZER Technology – the BXD12 out punches the competition with ease, style and tone. All these amazing features are lovingly packaged in highly portable, tilt-back enclosure that makes the BXD12 the ultimate player-friendly, onstage tone-machine. BUGERA ’s revolutionary high-voltage MOSFET preamplifier redefines solid-state bass tone, providing the sound, feel and immense dynamics of an authentic tube amp. Like with real vacuum tubes, the company's new MOSFET design equally operates at high voltages, providing this preamp with unheard of headroom to honor all of your playing dynamics; from your subtly-nuanced signature riff s and bass lines, to your most powerful, attention-grabbing solos. The ULTRABASS BXD12 is all about tone, and this highly-versatile and responsive MOSFET preamp provides an abundance of headroom for consistently crystal-clear and faithful sound reproduction – no matter what style of music your gig calls for.